In 2001, on a cool day in St. Paul, I crossed the finish line of the Twin Cities Marathon in 3:07. I had just accomplished my goal of qualifying for the Boston Marathon. I still remember that feeling of exhaustion, of the effort I held as I made my climb up Summit Avenue for the final push. “Don’t let up” I told myself, “Stay strong, keep pushing”. I remember looking off to the side at the spectators. One gentleman was sitting in his yard in a lawn chair reading the paper. I can still see him in that morning sunshine. “You jerk!” I thought. “I’m out here running a half way decent marathon, trying to get everything out of myself to reach a goal and you’re what, reading Sid Hartman’s prediction of the Viking’s upcoming season?” I remember being a little ticked but I used that to keep myself focused and motivated. Reaching the Cathedral I knew I was going to be under 3:10, the time I needed to qualify for Boston. Coming down that last hill, with the crowds cheering along the finish line, was something I’ll never forget. I was proud of my effort but there was also a sense of calm validation. I knew that I had had that ability and after my failed first attempt to qualify it felt like this time I had gotten over the hump, I had proven to myself what I knew was possible. I didn’t go run Boston that first time I qualified. It almost felt like simply qualifying was enough for me. However, now that I had gotten over that hurdle of running a qualifying time, I found I was able to continue to improve and was able to qualify a few more times. In 2003 I finally decided to go run the world’s most famous marathon. 2004 was the year I ran Boston. It was hot that day, the hottest Boston since 1976. The temp reached 89 degrees in Framingham. I also had a cold going into the race, so my performance turned out to be a slow marathon for me. I didn’t care one bit though, I realized that Boston is about celebrating your accomplishments. I tell runners this all the time; Boston is a tough course so don’t worry too much about trying to perform, to run your best. Instead take it all in, the whole weekend. The Expo, the race course, the crowds. Boston itself is a reward. For the average runner, it’s our Olympics, our mountain top. Enjoy the view. Qualifying for Boston for me took work, I didn’t have the natural ability to roll out of bed and run a BQ. 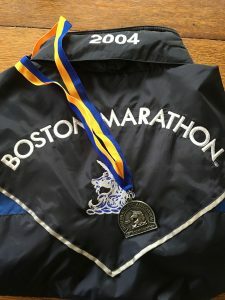 I have had the pleasure, and I mean that phrase in it’s truest sense, it has been an absolute pleasure, to coach several athletes to a Boston Marathon qualifying time. The fact that I had to work to get there has really helped me as a coach, I believe. I’ve been in those running shoes, I know what it is to work to achieve something that seemed unattainable, to strive for big goals. As a coach I have been able to use this experience to help others reach this same goal. Last year was an especially proud moment for me when I worked with a girl to help her qualify for Boston in only her second marathon. I was really proud of her effort and commitment. She is a talented runner and it was wonderful to be able to help her realize that talent. That’s one of the things that is so great about coaching, to be able to help people reach their respective potential. To get them to surprise themselves and see that they are capable of doing some amazing things. And on Monday, April 17th I’ll be watching Boston and cheering all of those who achieved their respective goals, who worked hard, stayed committed and perhaps discovered that they are capable of much more than they thought. Congratulations, you’ve reached the mountain top. I remember these events Tony and cherish all of the talk about your training and success. I am confident you are making a tremendous impact on the people you are coaching. Keep up the amazing work. Tony is one of the greatest Running Coach across the Northland.! Tony’s training plan helped me achieved my goals to all my races, most importantly he will not let you settle for small goals. He is discipline, an inspiration and an epic human being. I remember the day you qualified, Tony, and I was (and am) so proud of you reaching your goals. You have been an amazing inspiration to so many! Congrats on your success.